A workshop based on a morning ritual Ayurvedic Style. Learn a morning routine that starts your day promoting health and preventing disease. 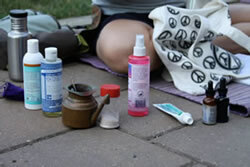 In this workshop we will learn the Ayurvedic techniques of Neti and Nauli along with a lesson on natural toiletries and avoiding the products that are loaded with toxic chemicals.